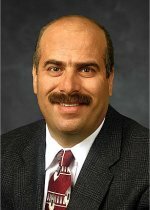 Moe Khaleel, director of the Computational Sciences and Mathematics Division and a PNNL Fellow, received the "ASME Setting the Standard 2008 Mechanical Engineer of the Year award" from the Columbia Basin Section of ASME (American Society of Mechanical Engineers) International. Khaleel was recognized for his leadership and contributions to computational engineering, specifically in increasing thermal efficiency of data centers, and fuel cell technologies. Khaleel's current research interests are tuned to world energy systems and the future role for fuel cell systems. He is the national coordinator for a program dealing with the modeling and simulation of Solid Oxide Fuel Cell as part of the Solid Energy Conversion Alliance. His work in this area is highly cited by the engineering and scientific communities. As director of PNNL's Computational Sciences and Mathematics Division, Khaleel leads the effort to provide scientific and technological solutions through the integration of high-performance computing, data-intensive computing, computational sciences, mathematics, scalable data management, and bioinformatics to advance the Laboratory's mission areas.